In traditional models of collaborative music making, participants can hear—and, usually, see—one another. Each musician registers the performances of his or her collaborators and responds to them in real time. Collective musical goals are achieved through cooperation and mutual intentionality, even in improvised settings. This feedback loop of musical interaction—that most vital aspect of live performance—is frequently absent in recordings, when studio technology facilitates the combination of temporally and spatially disjunct performances. Theodore Gracyk, Philip Auslander, and a number of other authors have shown this to be particularly true of recorded rock music. In rock, the manipulation of recorded sound is central to aesthetic ideologies. Documentary recordings may—and often do—comprise the constituent ingredients of such works; but overdubbings, tape-splicings, and other editing room procedures deliver to the listener a virtual performance, an apparition of musical interaction that never took place. Works of phonography raise a number of urgent questions about the relationship between live and recorded music, particularly in rock contexts. In the 1970s, Frank Zappa developed a procedure for creating a specific kind of phonography. 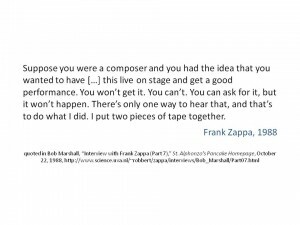 By altering the speed of previously recorded material and overdubbing unrelated tracks, Zappa was able to synthesize ensemble performances from scrap material. 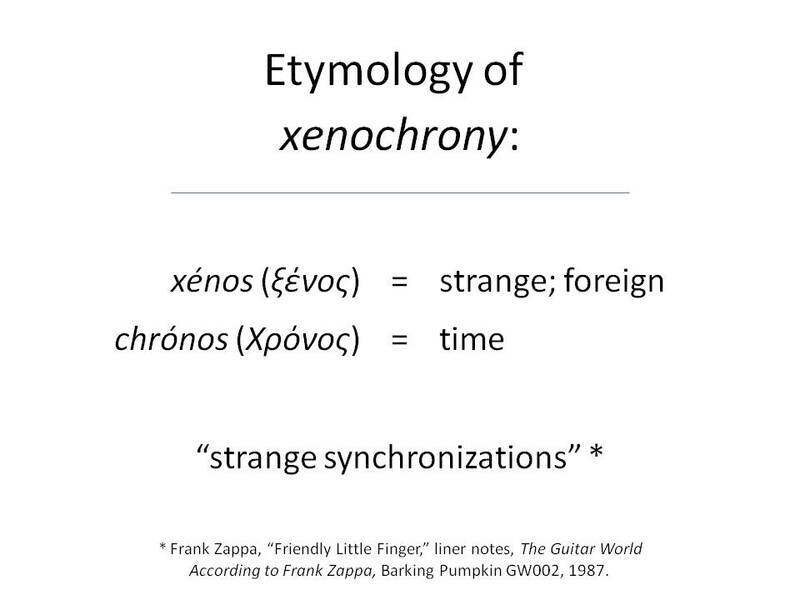 He referred to the technique as xenochrony—from the Greek xénos (strange; foreign) and chrónos (time). Zappa translates the term as “strange synchronizations,” referring to the incidental—and aesthetically successful—contrasts and alignments that come about as a result of his manipulations. the musical result [of xenochrony] is the result of two musicians, who were never in the same room at the same time, playing at two different rates in two different moods for two different purposes, when blended together, yielding a third result which is musical and synchronizes in a strange way. By combining separately-recorded performances, such music easily meets Brown’s criteria. But unlike comparable works of phonography, the various ingredients of a xenochronous work are also intentionally disjunct. Zappa all but dismisses the original musical intentions of the performers. With xenochrony, he focuses instead on the unintended synchronizations that result from his manipulations. In many cases, rock artists and producers mask their methods. Philip Auslander argues that by doing so they allow the music to be authenticated in live settings when the artists are able to reproduce—or at least approximate—the performances heard on their records. 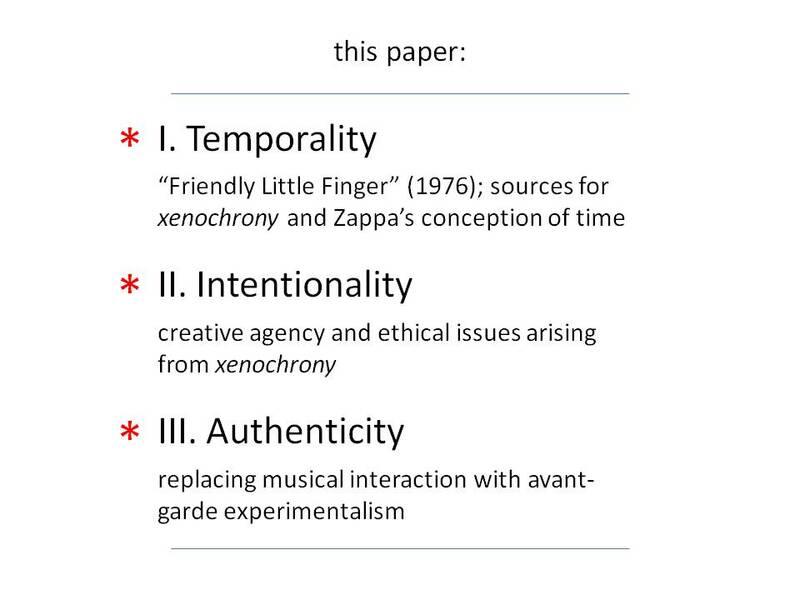 In this paper, I argue that Zappa’s xenochrony problematizes the status of live performance as a marker of authenticity. 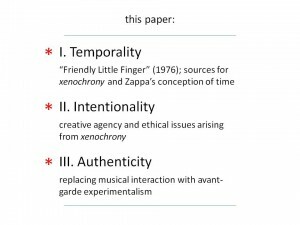 I will begin with an examination of Zappa’s song “Friendly Little Finger” to demonstrate the construction of xenochronous music and how the technique draws inspiration from the world of the art-music avant-garde. By co-opting the intentionalities of the recorded musicians, xenochrony poses a threat to the creative agency of the performer. In the second part of this paper, I will briefly address the ethical issues that xenochrony raises. Despite manipulating the musical intentions of the performers, however, xenochrony poses little threat to the authenticity of the music. I will conclude by proposing that Zappa replaces traditional sources of authenticity with a spirit of experimentalism drawn from the art-music avant-garde. 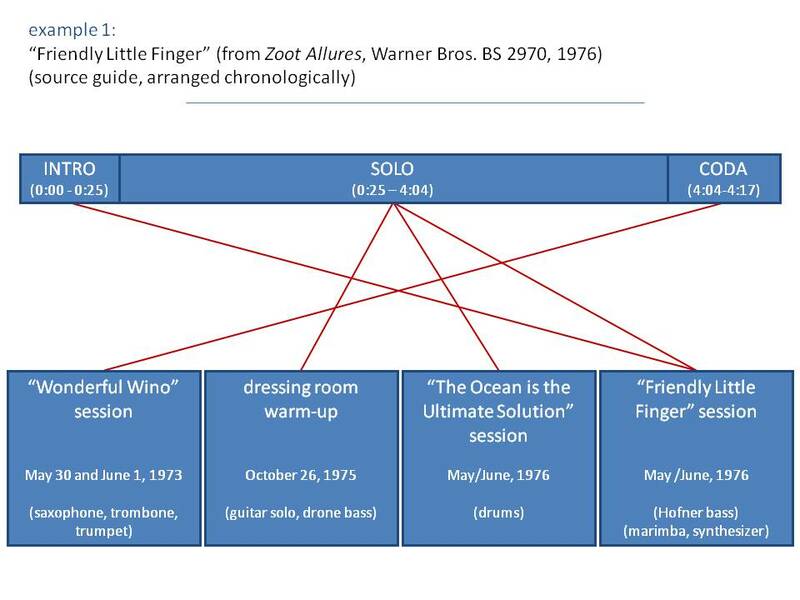 To the uninformed listener, there is no strong evidence to suggest that Zappa’s “Friendly Little Finger,” from the 1976 album Zoot Allures, is anything other than a recorded document of an ensemble performance. The piece begins with a brief introduction featuring a repeated riff performed on guitar, marimba, and synthesizer. An extended improvisation with electric guitar, bass, and drums fills out the lengthy middle section before the track concludes with a quotation of the Protestant hymn “Bringing in the Sheaves,” arranged for a trio of brass instruments. 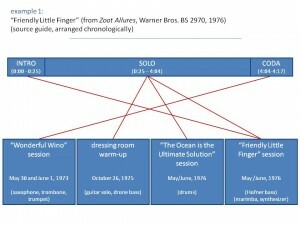 Despite its apparent normalcy, however, “Friendly Little Finger” combines materials from four distinct sources spanning three years of Zappa’s career. As Example 1 makes clear, the result of Zappa’s editing is a moderately dense network of temporally disjunct recordings. How is it that such seemingly disparate recordings happened to come together in this way? What inspired Zappa to take such an approach to manipulating recorded sound? Of course, examples of overdubbing in American popular music can be found at least as far back as the 1940s—recall Sidney Bechet’s One Man Band recordings in which each instrument was performed separately by Bechet himself. But while such tricks had become old hat by the mid 1970s, xenochrony stands out for it also has obvious ties to the twentieth-century art-music avant-garde. Despite his continuing reputation as a popular musician, Zappa was remarkably well read in the theoretical discourse surrounding avant-garde art music, particularly with regards to musique concrète and tape music. He expressed an ongoing interest in John Cage’s chance operations, for example, trying them out for himself by physically cutting recorded tapes and rearranging the pieces at random for the 1968 album Lumpy Gravy. Another figure who had a profound impact on Zappa’s development as a composer was Edgard Varèse, whose music he discovered at an early age and whose writings served as inspirational mantras. Given this fascination with the avant-garde, xenochrony may be best understood as a conscious attempt by Zappa to model himself on these influential figures. His own approach to music and composition would therefore require an analogous theoretical foundation. I think of time as a spherical constant, which means that everything is happening all the time. […] They [human beings] take a linear approach to it, slice it in segments, and then hop from segment to segment to segment until they die, and to me that is a pretty inefficient way of preparing a mechanical ground base for physics. That’s one of the reasons why I think physics doesn’t work. When you have contradictory things in physics, one of the reasons they became contradictory is because the formulas are tied to a concept of time that isn’t the proper model. 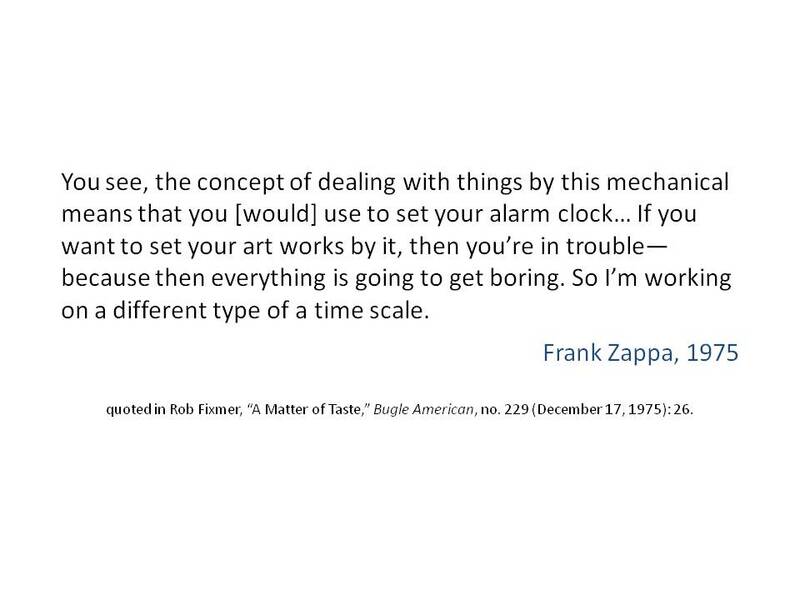 You see, the concept of dealing with things by this mechanical means that you [would] use to set your alarm clock… If you want to set your art works by it, then you’re in trouble—because then everything is going to get boring. So I’m working on a different type of a time scale. 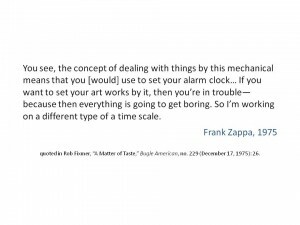 This second quotation dates from about the same time that Zappa began experimenting with xenochrony and seems suggests that the two ideas were closely related. 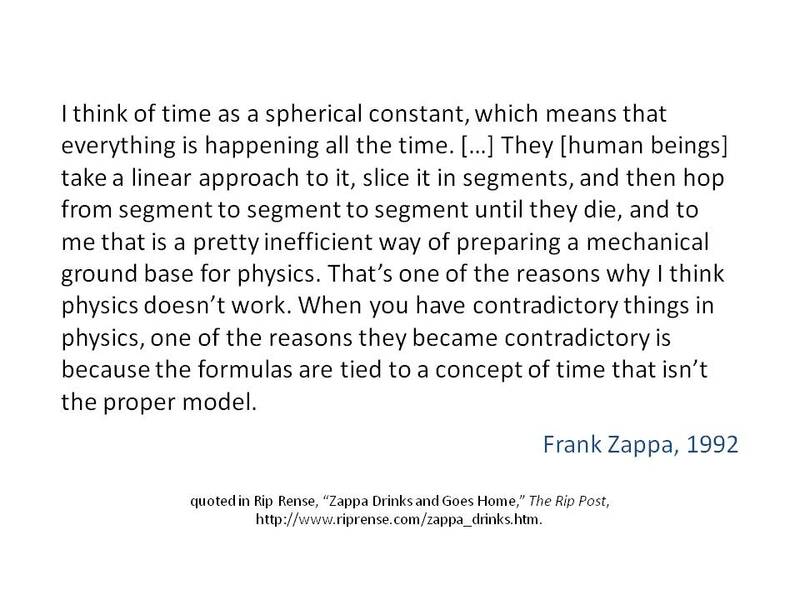 Zappa’s conception of time may therefore be understood as a convenient justification for potentially contentious editing procedures. Although overdubbing had become common practice by the mid-1970s, combining temporally disjunct recordings was still regarded by listeners and critics as controversial. 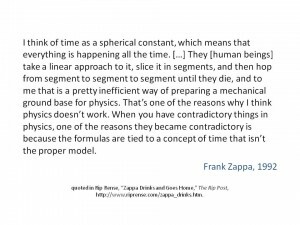 By reconfiguring the very concept of time, Zappa skirts the issue. 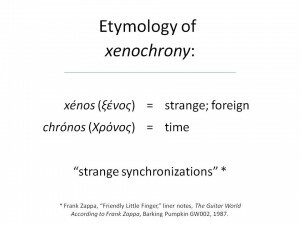 But even if Zappa successfully renders temporality a non-issue, xenochrony still raises questions about intentionality. Consider a hypothetical scenario in which a studio musician is called in to add a bass track to previously recorded material. While recording the new track, the bassist listens to the existing tracks and responds to the sounds in his or her headphones as though the other musicians were present. (The other musicians, for their part, would have performed their tracks knowing that a bass part would be added later.) Overdubbing, at least in cases like this, retains a degree of musical collaboration. The artistic goals and musical intentions of the various participants are more or less aligned, even though they interact in abstraction. Xenochrony, however, dispenses with intentionality altogether. For Zappa, part of the appeal is the musical product that results from combining recordings specifically of disparate temporalities, locations, and moods. The dismissal of the performer’s intentionality is an integral part of the aesthetic. It is not my intention here to delve too deeply into issues of morality. Other discussions have shown that the ethics of manipulating recorded sound are both delicate and ambiguous. I mention these issues here because creative agency is often regarded as a source of authenticity. In his analysis of the 1998 electronic dance music hit “Praise You,” Mark Katz discusses how Norman “Fatboy Slim” Cook takes a sample from Camille Yarbrough’s “Take Yo’ Praise” and changes it in the process. In “Praise You,” Cook isolates the first verse of Yarbrough’s song and changes the tempo and timbre. Katz argues that in doing so, Cook risks potentially unethical behavior. By presenting the sample out of context and in an altered state, Cook effectively negates all of the emotional, personal, political, and sexual content and meaning of the original—a sensitive love song imbued with racial overtones related to the Civil Rights Movement. Cook therefore presents a threat to Yarbrough’s artistic agency. Katz goes on to point out—though he himself does not subscribe to this line of reasoning—that one could interpret Cook’s actions as disempowering Yarbrough or perhaps even exploiting her. Zappa takes similar risks with xenochrony. 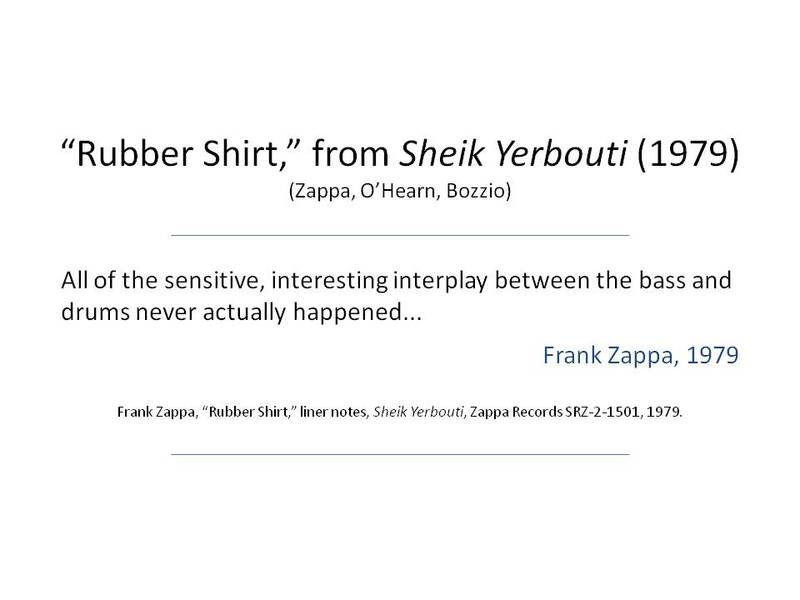 Consider the 1979 track, “Rubber Shirt”—another xenochronous work which combines unrelated performances by bassist Patrick O’Hearn and drummer Terry Bozzio. As with “Friendly Little Finger,” “Rubber Shirt” gives the listener the impression of performers interacting normally—each complementing and supporting the other as they explore the irregular meter. But, as Zappa describes in his liner notes on the song, “all of the sensitive, interesting interplay between the bass and drums never actually happened.” While neither Bozzio nor O’Hearn had any part in this “sensitive, interesting interplay,” their performances by themselves are highly expressive. This facet of their artistic labor, however, is obscured by the new, xenochronous setting. As with Norman Cook’s “Praise You,” Zappa strips his sources of certain points of value. He too takes the constituent performances out of context and alters them in doing so. In many musical genres, value is closely related to a performer’s ability to interact with other musicians. 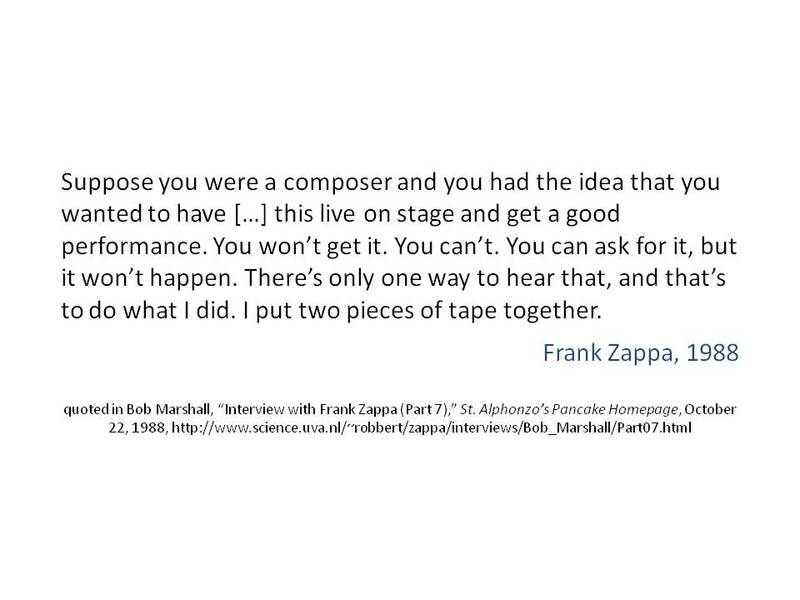 When Zappa simulates interaction by xenochronously combining individual recordings, he projects new musical meaning onto performances that the original musicians did not intend. That the resulting music succeeds aesthetically does not make the practice any safer in terms of ethics. 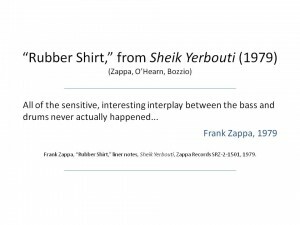 Of course, there are also some obvious differences between “Praise You” and “Rubber Shirt,” the most important being the financial relationship between Zappa and the members of his various ensembles. O’Hearn and Bozzio were paid employees, hired to perform Zappa’s music. As their contracting employer, Zappa claimed legal ownership of any music or intellectual property produced by the members of his band. This policy seems to have been somewhat flexible in practice—O’Hearn and Bozzio are given co-writer credits for “Rubber Shirt”—but in most cases the performers of xenochronous works are not acknowledged. Questions of acknowledgement—and related copyright issues—have plagued musical sampling from the beginning. But again, xenochrony complicates the issue. Many of the tracks on Zappa’s 1979 album Joe’s Garage, for example, feature guitar solos extracted from concert performances xenochronized with studio backing tracks. All of the audible musicians are credited in the liner notes. But what of the musicians that aren’t audible? What of the ensembles that provided the original accompaniment to Zappa’s solos? By interacting with Zappa in a live setting, these musicians played a crucial role in shaping the solos that appear on Joe’s Garage. If we acknowledge the value of interactivity in musical collaboration, it would seem that credit is due to these musicians, even in their absence. In his book Liveness: Performance in a Mediatized Culture, Philip Auslander argues that recorded and live performances are symbiotically linked in rock culture. Here, Auslander disagrees with Theodore Gracyk—who, in his 1996 book Rhythm and Noise; An Aesthetics of Rock, describes these types of performance as separate media. Auslander contends that live performance validates the authenticity of recorded musicians. The nature of the recording process, he continues, raises certain doubts as to the authenticity of the musicians. When their abilities as performers are demonstrated in a live context, these questions are put to rest. According to the rock ideologies Auslander describes, studio manipulation is typically cast in a negative light. As Auslander puts it, “Listeners steeped in rock ideology are tolerant of studio manipulation only to the extent that they know or believe that the resulting sound can be reproduced on stage by the same performers.” I would venture to say that a majority of listeners are informed when it comes to the recording process. Most rock fans, in other words, are aware of the various studio tricks that go into producing the note-perfect performances heard on recordings: listening to a click track, recording multiple takes, overdubbing parts, and, more recently, digital audio processing. Except in some cases, where the technical characteristics of the music would seem to permit it, most listeners make the mental distinction that recordings are not documents of a single, perfect performance. 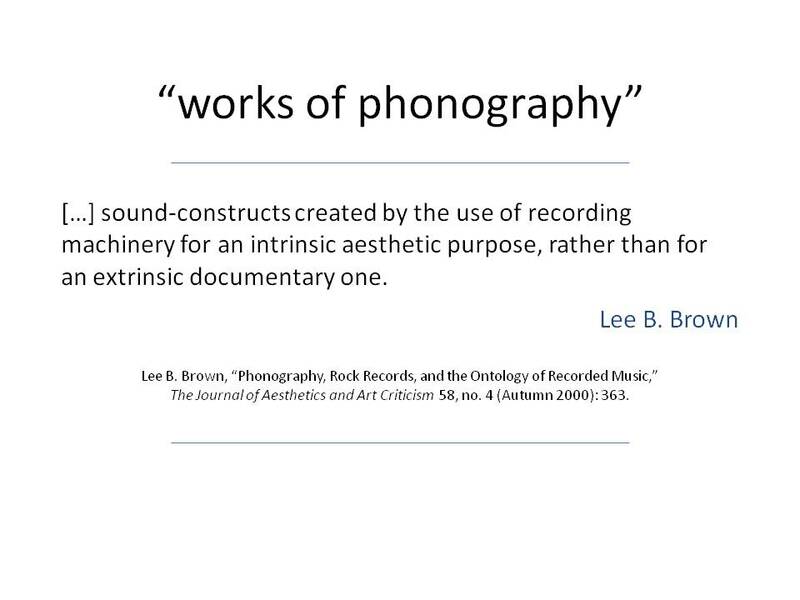 If Auslander is correct in his assessment of how rock ideologies view recordings with suspicion, this may, in turn, influence the terminology used to describe the process. Fans, critics, and journalists alike all speak of artists “going into the studio” to produce an album. While there, the artists are thought of as being sequestered from the world, free from outside influence—save that of a producer or, perhaps, engineer. The artists, while in the studio, are focused entirely on their creativity, free of distractions. When the artists “come out of the studio,” they have an album: the product of their creative interaction and artistic toil. Such discourse paints the studio process as having a certain purity. Suppose you were a composer and you had the idea that you wanted to have […] this live on stage and get a good performance. You won’t get it. You can’t. You can ask for it, but it won’t happen. There’s only one way to hear that, and that’s to do what I did. I put two pieces of tape together. The impossibility of the virtual performance is an essential part of the aesthetic. Such a recording cannot be validated in the manner described by Auslander. Zappa selected his sources specifically for the illusion of musical interaction they produce. Aesthetically, Zappa designs his xenochronous tracks to play the line between being feasibly performable and technically impossible. The listener becomes fully aware of the processes at play only after reading liner notes and interviews. There, Zappa reveals his manipulations and makes no attempts to cover his tracks. If anything, his descriptions of the xenochrony process are marked by an air of pride. 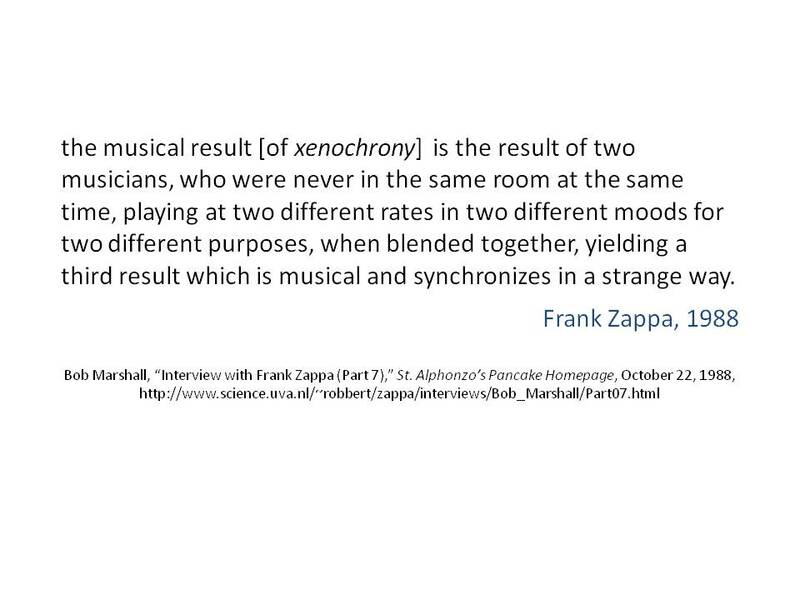 Zappa’s listeners—who tend to be more attentive to published discussions of the music than most rock listeners—appreciate xenochrony on its own terms. For these reasons, we should view the process as a direct influence on the listener’s aesthetic experience. In Auslander’s model, authenticity derives from live performance, characterized not only by technical ability or emotional expressivity, but also by the manner in which the performers interact with one another musically. Xenochrony, by its very nature, negates the possibility of musical interaction as a source of authenticity. Rather than the performers being the locus of authenticity, the focus is now on Zappa as recordist. Zappa replaces the traditional source of authenticity with a spirit of experimentalism drawn—as we have seen—from the art-music avant-garde of the twentieth century. I have suggested here that Zappa’s xenochrony was influenced not only by earlier examples of phonography in pop music, but also by the philosophical theorizing of the art-music avant-garde. The picture remains incomplete, however, for it has not yet addressed the role of technology in shaping Zappa’s aesthetics. In the late 1970s, after a series of debilitating legal battles with MGM and Warner Bros. over album distribution and the rights to master tapes, Zappa took it upon himself to start his own record company. Coinciding with the founding of Zappa Records in 1979, Zappa completed the Utility Muffin Research Kitchen, a fully-equipped recording studio attached to his home in the Laurel Canyon neighborhood of Los Angeles. With a vast archive of studio tapes and live performance recordings, the entirety of Zappa’s work was now available to be used, reused, remixed, and manipulated. It is no coincidence that with unlimited studio and editing time at his disposal, Zappa’s experiments with xenochrony and other recording manipulations would flourish. Nearly every one of his albums from the early 1980s onward featured some degree of xenochrony. 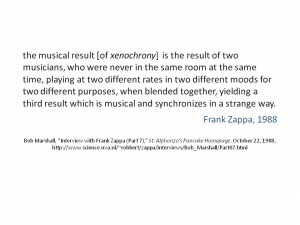 Though far from being a direct influence, we may view Zappa’s xenochrony as foreshadowing the widespread use of digital sampling in popular music. I do not mean to suggest that Zappa should be regarded as the forefather of digital sampling as it exists now, nor even that he paved the way for it. But I do see a provocative parallel. Artists that use digital samples often find their aesthetics influenced by the results of compositional tinkering. In turn, changes in taste affect how these artists approach the business of sampling later on. I see a similar relationship between Zappa and xenochrony. 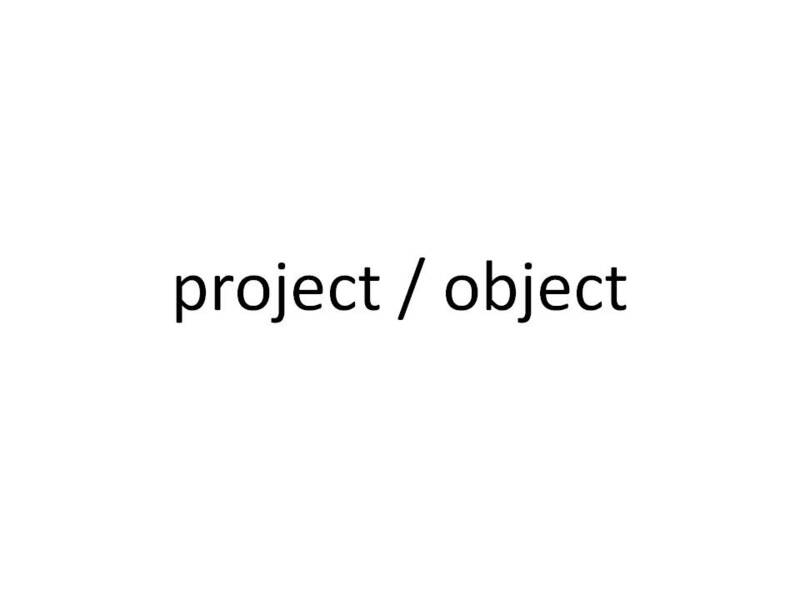 In both cases, the artist interacts with his or her compositional processes, effectively setting up a feedback loop between aesthetics and means of production at hand. 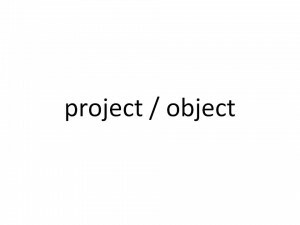 Individual compositions and recordings—the constituent elements of the “project/object”—are treated not only as works in and of themselves, but as potential raw material. Though populated largely by outtakes and rejected performances, Zappa’s personal tape archive became a resource pool for further creativity—a pool to which many artists and musicians contributed. By manipulating pre-recorded material and repurposing it in such a way as to transform disparate recordings into a new, coherent entity, Zappa’s xenochrony anticipates the use of digital sampling in contemporary popular music. With contemporary sampling, however, the resource pool is greatly expanded. Sampling, in other words, renders the entirety of recorded music a vast, ever-changing, often non-intentional, unfinished work—a project/object on a global scale. Lee B. 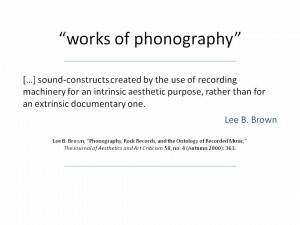 Brown, “Phonography, Rock Records, and the Ontology of Recorded Music,” The Journal of Aesthetics and Art Criticism 58, no. 4 (Autumn 2000): 363. Bob Marshall, “Interview with Frank Zappa (Part 7),” St. Alphonzo’s Pancake Homepage, October 22, 1988, http://www.science.uva.nl/~robbert/zappa/interviews/Bob_Marshall/Part07.html. Philip Auslander, Liveness: Performance in a Mediatized Culture, 2nd ed. (London: Routledge, 2008). Frank Zappa, Zoot Allures, Warner Bros. BS 2970, 1979. Rip Rense, “Zappa Drinks and Goes Home,” The Rip Post, http://www.riprense.com/zappa_drinks.htm. Rob Fixmer, “A Matter of Taste,” Bugle American, no. 229 (December 17, 1975): 26. Mark Katz, Capturing Sound: How Technology Has Changed Music (Berkeley: University of California Press, 2004), 145-151. Frank Zappa, Sheik Yerbouti, Zappa Records SRZ-2-1501, 1979. Frank Zappa, Joe’s Garage, Act I, Zappa SRZ-1-1603, 1979; and Frank Zappa, Joe’s Garage, Acts II & III, Zappa SRZ-2-1502, 1979. Theodore Gracyk, Rhythm and Noise: An Aesthetics of Rock (Durham [NC]: Duke University Press, 1996).